When we visit New Orleans, I can’t get enough of these southern treats! They are just perfect for the holidays. So I thought would make a double batch. If the mixture gets too hot, the candy will be dry and crumbly. If it isn’t cooked long enough, the mixture will be runny and sticky. One trick we learned after making several batches in our Test Kitchen is to remove it from the heat at about 232°. The mixture will continue to climb to the required temperature (236°). A candy thermometer gives the best temperature reading and takes out most of the guesswork. We like to use two thermometers for accuracy. Beat the mixture with a wooden spoon just until it begins to thicken. You’ll feel the mixture become heavier, and its color will become lighter. Often the last few pralines that you spoon will be thicker and less perfectly shaped that the first, but they’ll still be just as good. The candy tastes the best if eaten within a day or two; pralines become sugary and gritty with age. Be sure to store them in an airtight container (a metal tin works well). 1. Preheat oven to 350°. Bake pecans in a single layer in a shallow pan 8 to 10 minutes or until toasted and fragrant, stirring halfway through. Cool completely (about 15 minutes). 2. Meanwhile, bring brown sugar and next 3 ingredients to a boil in a heavy Dutch oven over medium heat, stirring constantly. Boil, stirring occasionally, 6 to 8 minutes or until a candy thermometer registers 236° (soft ball stage). Remove sugar mixture from heat. 3. Let sugar mixture stand until candy thermometer reaches 150° (20 to 25 minutes). Stir in vanilla and pecans using a wooden spoon; stir constantly 1 to 2 minutes or just until mixture begins to lose its gloss. Quickly drop by heaping tablespoonfuls onto wax paper; let stand until firm (10 to 15 minutes). Chocolate-Pecan Pralines: Prepare as directed through Step 2. Add 2 (1-oz.) unsweetened chocolate baking squares to sugar mixture. (Do not stir.) Proceed as directed in Step 3. Café au Lait Pecan Pralines: Add 2 Tbsp. instant coffee granules with brown sugar in Step 2. Bourbon-Pecan Pralines: Add 1/4 cup bourbon with brown sugar in Step 2. Have to go shopping I don’t have any whipping cream. 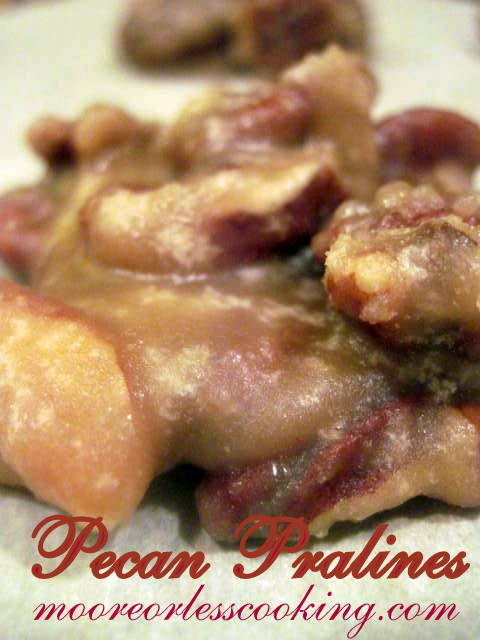 being a southern cook, Praline pecans are wonderful. I make a Praline Pecan Icing to top a sweet potato cake and it is sinful.